I need a help with an WorkFlow. When an user create a new item the initial default state field is "Ongoing" (need to send an email for address "x") and when the owner complete the tasks he change the State field to "Completed" (need to send an email for "Approver" field address). After the approver check this item he can change to "Approved" or "Pending": If he change to "approved" (send an email to address "x") and end WorkFlow. If he change to "pending" the workflow need to return to first step "ongoing" and send an email to Owner. start it automatically when an item is created. Send email to address "x". Start it automatically when the item is edited. If user changes the State field to "Completed", send an email to Approver. If the State field is changed to "Approved", send an email to address "x". If the State field is changed to "Pending", send an email to Owner and change the State to "Ongoing". Note: If you are sending emails to external email addresses, you need to use SharePoint 2010 workflows instead of SharePoint 2013 workflows because of the security enhancement in SharePoint 2013 workflows. Not the answer you're looking for? Browse other questions tagged 2013 sharepoint-enterprise sharepoint-designer or ask your own question. 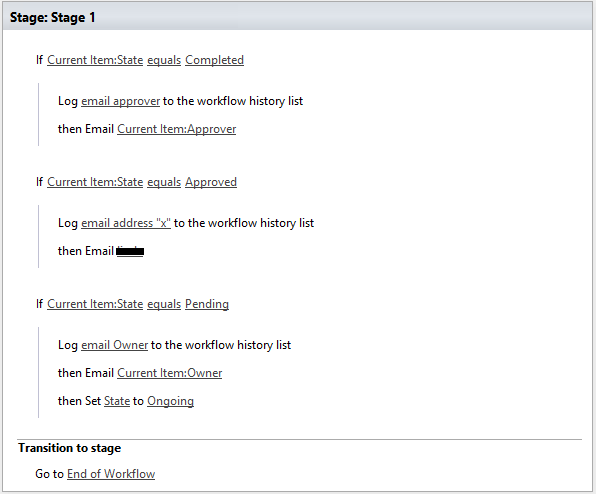 Will content approval workflow send email alert and show up in tasks?